Hello there! So glad you stopped by Two Dogs today because I am about to burst with news. You will think I am getting feeble minded when I tell you that news, but that’s OK. I’m smiling from ear to ear and please remember: Only crazy, whacked out people smile all the time! Uh huh! 🙂 So what’s this fabulous news? Remember those tomato plants I put in the ground in MARCH? Planted in-ground and covered with a Wall-o-waters? These plants endured numerous hard freezes for several days at a time, some nice days, some downpours of rain, hail — the whole gamut — but mostly too-cold-for-a-garden-to-grow weather. After all that, June finally arrived, and the weather seemed to settle down, although we did have a cold night or two beyond our supposedly frost-free date. Those tomato plants survived although a couple of them looked pretty rugged. The hot/cold seesaw didn’t do them any favors and I had to remove a few branches that were pretty much done for. 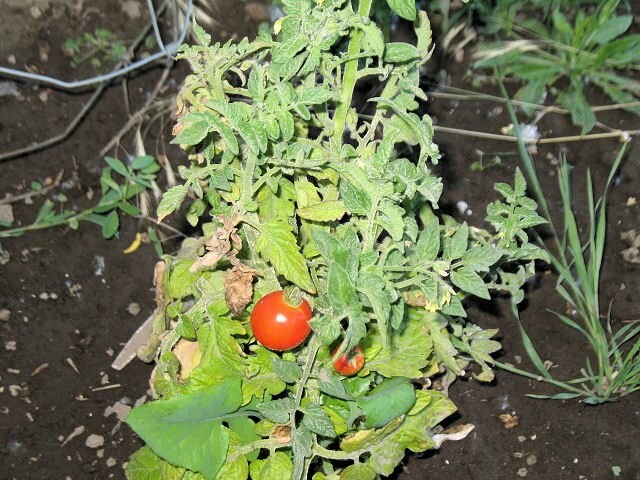 BUT —— almost to a plant, there are tomatoes already setting on those vines. They aren’t big, but they are there and the plants are covered with lots of blossoms. I even have ripe tomatoes on two of them! It is unbelievable and I just had to take a picture to show you. Thanks so much for stopping by today. I hope you have a wonderful week! Author 2DogsTravelPosted on June 28, 2010 March 13, 2016 Categories Garden1 Comment on Tomatoes —-Yes!